Chabad-Lubavitch Rabbi Mordechai Abergel, spiritual leader of Singapore's Jewish community, greets visitors at an event sponsored by the local Jewish Welfare Board. The Jews of the tiny Asian nation of Singapore have been eating more kosher chicken lately, thanks to the opening last June of a restaurant located on the premises of their community's newly built Jacob Ballas Centre. Under the supervision of Singapore's Jewish Welfare Board, the community has as its spiritual leader Rabbi Mordechai Abergel, a Chabad-Lubavitch emissary who arrived in 1994. A trained ritual slaughterer, one of Abergel's many responsibilities is to ensure that the hundreds who patronize the Awafi kosher restaurant have plenty of fowl. "Since we opened the restaurant, kosher food consumption has experienced quite a sharp increase," says the rabbi. "I am slaughtering a lot more chicken than I used to." His wife, Simcha Abergel, explains that the establishment - which serves Middle Eastern, Italian, Chinese and Indian cuisine and caters to locals and tourists alike - is just another sign of a revival in the densely populated city's 1,000-strong Jewish community. "Both the new and old generations are becoming more observant of their heritage," she says. The Maghain Aboth Synagogue operates under the auspices of the state-recognized Jewish Welfare Board. It was founded in 1878 and draws between 50 and 100 people for its weekly Shabbat services. The city's Ganenu Learning Centre, which was founded by the Abergels in 1996, is another of the many aspects fueling the revival. Two ritual baths, an old aged home, an established rabbinical program, a fully booked social community calendar, a Hebrew school, adult learning program, and Jewish burial society, round out the community's offerings. 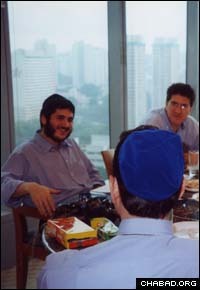 Chabad-Lubavitch rabbinical student Mendy Kotlarsky gives a Torah class to Jewish businessmen in Singapore. The Abergels - who are assisted by Chabad-Lubavitch Rabbi Netanel and Odelia Rivni - are especially proud of the preschool. When it opened, only four students attended; today, its roster boasts 77 pupils. "Ganenu helps young ones get their initial Jewish introduction," says Simcha Abergel. "This education becomes the first step towards a fulfilling Jewish life." And with all the government permits in place, work is now on to open a primary school in August. "We're going to start with one class, and then add a grade each year for the first few years" says Abergel, a member of the committee overseeing the preschool and the community's other educational activities. For the adults, Mordechai Abergel and the Jewish Welfare Board run the Gesher Program, which brings in speakers from all over the world, including Rabbi Sir Jonathan Sacks, Chief Rabbi of Great Britain; Rabbi Adin Steinsaltz, a noted Talmudist and scholar from Jerusalem; and Rabbi Manis Friedman, founder of the Bais Chana network of programs for women. "We're in the midst of a tremendous revival," proclaims Abergel. "And with the continuous support of the Jewish Welfare Board and the commitment of our community members, I am sure that each year will bring something new and make us grow from strength to strength."